Introduce Five Times Dizzy by Nadia Wheatley as a story about Mareka, a young girl who has migrated from Greece with her family, and her life in a multicultural community in an inner-city neighbourhood in Australia in the 1970s. What does migration mean? Explore a text or website such as Waves of Migration to view the images and briefly discuss who has migrated to Australia and why. Are we all migrants? Students can discuss their own heritage. Invite students to share stories of where their families were originally from. You could use a wall map, or online mapping tool to create a visual artefact. Using a strategy such as think-pair-share students could consider what they think the title ‘Five Times Dizzy’ means. What could dizzy mean in this context? Why five times? What could the story be about? Many aspects of the text may be unfamiliar to students and the following activities could be used to explore these as they present in the story. Forgotten Goats is a BTN story which gives a brief account of the place of goats in Australia’s history. Use a map to show where Newtown, Sydney and Crete are. Use Google Earth to view the Sydney suburb of Newtown. A walk through using street view will reveal shops with the cut-off step as shown on the cover and introduced in Chapter 2, for students who may be unfamiliar with an inner city setting. Then pan to Pantania, a small village on Crete, Greece. Street view is not available but you will be able to identify its more remote location. The origin of the title of the novel ‘Five Times Dizzy’ is discovered in Chapter 2. The author refers to the folk dance from Crete – the Pentozalia (the five-times-dizzy dance). View this YouTube video of the dance. Why is Mareka feeling this way? Dancing is an important part of the Greek culture. View Syrtos Greek Dancing on Youtube. The text was set in a contemporary time when it was first published in 1982, probably drawing on life from the 1970s, but it could be examined in a historical context today with young readers. If Mareka lived in our community today what would be the same? What would be different? Students can find examples from the text. In your own local community what cultural groups have influenced the development and character of the community as it is today? List any groups. Invite local community members from different cultural groups to share their stories. Can students draw comparisons between these experiences and those in the story? The text can also be explored in a cultural context, by examining the Greek way of life presented in the novel. The strong role of family is explored in this text. The family unit spans over three generations in this novel. Read the first two chapters. First in small groups, then as a whole class students discuss how the younger and older generations are portrayed in this text. Yaya is yearning for her home and Mareka has the idea of trying to find Yaya a job. In small groups students consider what Mareka is trying to do. They then discuss their own relationship with their grandparents and the things they do together. My Place for teachers has a number of resources and activities for this period, showing Greek immigrants and the language barriers that they faced. In particular Episodes 5 and 6 of Series 1 focus on this period. Watch the comedic short clip Speaking the Language and discuss how the character of Sofia handles interpreting for her family. Compare this to the character of Mareka and her more sensitive dealings with pronunciation and spelling for her family (pages 7 and 11) and later interpreting for her grandmother (page 85). As the students have discussed both the historical and cultural context around the text, have them identify other texts that feature either immigrants or migration and deal with family values and generations. Remind them of the My Place episodes detailed above as multimodal examples. Brainstorm other texts both written and multimodal. Students contribute to a class list of texts they might like to read. As students have read to at least the end of Chapter 2 they can create a Venn diagram to compare and contrast the family in the novel, to their own family unit, focusing on the relationships across three generations. Select information, ideas and events in texts that relate to their own lives and to other texts. Listen to others’ views and respond appropriately. Describe literal and implied meaning connecting ideas in different texts. Express preferences for particular texts, and respond to others’ viewpoints. Listen for key points in discussions. Personal Repertoire: What is familiar to you? Is the family like yours? Did you recognise anything like you have in your home? Social Repertoire: Do you live in a neighbourhood like that? Do you play with your friends on the street? Do you work in your parents’ business? Cultural Repertoire: Do you know where Newtown is? Where Crete is? What experiences are familiar to you (lighting of the candles, fetes, traditional dancing)? Literary Repertoire: Have you read any other books by this author? Are there any other texts named in this text? In small groups students take turns to create a freeze frame of selected scenes portraying the emotions of the characters in the passage. The rest of the class writes down all the emotions that they can identify. Passage could then be read aloud by teacher facilitating a discussion about the language and how this helps create images for the reader. Viewing students could contribute suggestions for improvement to the freeze frame. Some suggested scenes from text are: Mareka, Mama, Costa screaming, Yaya wailing and Baba panicking on page 4; Mr Willoughby looming over Yaya on page 19; Mama, Mareka and Baba in the heated discussion around feeding a goat on page 42; Jennifer revealing Mareka had a secret in front of Baba on page 55; Mareka and Patricia after playing a trick on Mr Willoughby on page 77. During reading of text use a whole class graphic organiser such as a story map to support students’ comprehension and understanding of the elements of narrative structure. Use of graphic organisers helps illustrate pivotal points in the plot such as when characters face choices and how the author makes us care about the character’s decisions or what happens to them. In small groups look at opening pages of the novel and identify the gaps in information (in setting and character) and predict how they, as readers, may find out this missing information. Explore how the author develops characters through the use of dialogue and their relationships with other characters and the reactions of characters to them. Divide the class into small groups and allocate each group a character such as Mareka, Yaya, Rolley Wilson or Mr Willoughby. Students should discuss their feelings about this particular character, identifying and then drawing actual examples from the text of either their actions or dialogue, to suggest what character traits these reveal. A graphic organiser (such as the S.T.E.A.L. template) could be used to organise their thinking. Use Google earth to view the Sydney suburb of Newtown. A walk through using street view will reveal shops with the cut-off step as shown on the book’s cover and introduced in Chapter 2, for students who may be unfamiliar with inner-city suburbs. Then pan to Pantania, a small village on the island of Crete, Greece. Street view is not available but you can identify the contrasting remoteness of this location. Reread Chapter 1 and list the phrases that establish the setting on an interactive whiteboard and discuss how the author has presented the setting. The novel opens up the opportunity to discuss multicultural communities and how many people live in two cultures. Many students in the class may identify strongly with this. The author’s light use of Greek words in the text gives the reader greater insight into the bilingual world of the characters. Dialogue in Greek is usually repeated in the English translation but in some cases the reader is left to interpret the English translation, based on the action surrounding the dialogue. These paragraphs could be examined to discuss the language the author has used around this dialogue and based on this, what the Greek words could mean. Students could also use Google Translator afterwards to interpret the Greek text. Students discuss why the author has chosen to include some Greek words in the novel. In Chapter 10 the author uses the character of Mr Willoughby to explore the theme of intolerance and prejudice. Lead a sensitive class discussion around this chapter and these issues and discuss why students think the author has used these language choices. How would you feel if you were Mareka? Would this type of language be tolerated today in the real world? This theme could be explored further through Australia’s National Harmony Day website. In pairs, students reread Chapter 3 and examine more closely how the author has established the setting, from the character of Yaya’s point of view. How does Yaya describe the neighbourhood? Use a Venn diagram to compare and contrast Yaya’s new home to her old home. Students should record actual phrases from the text. Using these phrases, students work in pairs and describe the imagery the author has created. Students might draw these images from Yaya’s point of view. As a class discuss how her description implies how she feels about the neighbourhood? What does she feel about her old home? Students create a book report which lists the pivotal points in the plot, identifies the different points of view of the characters, discusses the setting and theme of the novel, and includes their recommendations. Negotiate with students a rubric for scaffolding their writing and assessing their responses. Students could then use this report to create a book trailer. Understand how language features, images and vocabulary choices are used for different effects. Read texts that contain varied sentence structures, a range of punctuation conventions, and images that provide additional information. Identify literal and implied meaning connecting ideas in different parts of a text. Listen to others’ points of view and respond appropriately. Understand how language can be used to express feelings and opinions on topics. Texts include writing and images to express and develop in some detail experiences, events, information, ideas and characters. Create a range of texts for familiar and unfamiliar audiences. Explain how language features, images and vocabulary are used to engage the interest of audiences. Understand how to express an opinion based on information in a text. Create texts that show understanding of how images and detail can be used to extend key ideas. Create structured texts to explain ideas for different audiences. Make presentations and contribute actively to class and group discussions, varying language according to context. Demonstrate understanding of grammar, select vocabulary from a range of resources and use accurate spelling and punctuation, editing their work to improve meaning. constructing emotional conflict for the focalising character within the family, or outside of it, or both. The author has used a number of points of view for the characters in the text including Mareka, Yaya, Mr Willoughby and Rowley. Reread Chapter 13 and Yaya’s account of the fete in her letter to Mareka’s uncle in Greece (page 74). Have students compare and contrast these perceptions of the character to their own feelings about these events in the story. Construct a class online word wall using an online tool such as Padlet where new vocabulary can be displayed and students can use this as a resource in their own writing. Mr Willoughby crashed open his door. The man loomed over her threateningly. He shooed at her and she scurried back across the street like a hen. Mr Willoughby crashed open his door and Yaya was suddenly frightened. She’d simply been looking for the sake of looking, as you do if you’ve got plenty of time and nothing to fill it. In Greece, people look at their neighbours all the time. In Greece, you don’t live behind walls and fences. What was the man saying? What did he want? The man loomed over her threateningly. Though he too was old he was tall, as Australians are, with thick white hair and a red face. Yaya was barely as tall as Mareka. ‘Git, git, go on, git out of it!’ He shooed at her and she scurried back across the street like a hen. Mr Willoughby opened his door and Yaya was frightened. She was just looking. In Greece look at their neighbours and don’t live behind walls and fences. The man stood above her. Though he was old he was tall, with white hair and a red face. Yaya was as tall as Mareka. ‘Git, git, go on, git out of it!’ he said and she went back across the street. If you looked at Yaya now and Yaya in the photo – well, it just wasn’t like looking at the same person. Imagine a ball, a really hard, bouncy one. Then pretend you puncture it, sit on it, squash out all the air. That the was the difference. Yaya was limp now, limp and tired. It was as if the new country had squeezed all the life from her. Discuss the picture that this creates in the reader’s head. Students write their own description of a character such as Mr Willoughby comparing him to an object. Mareka’s father is determined that his family is going to be ‘Australian’. 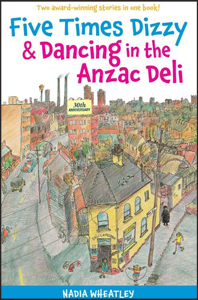 Mareka is living in two cultures, but the author has given the reader the impression that Mareka is already comfortable in Australian culture through the language the characters use and their behaviour. Allocate students specific chapters where they work in pairs or small groups listing the specific words or phrases that have been used to develop Mareka’s character. Colloquial language is a part of our Australian identity. Students can explore Slang – the history of Australian English to see if they can locate the origins of any of these terms. Can they identify any neologisms, spoonerisms or puns in the text. Students collect examples to contribute to a class wall chart. Using a familiar scene from the book, modify text to use just base noun and verb groups, as explored above. Students use this modified text and rewrite, extending noun and verb groups and adding circumstances to create richer descriptions. Using a nominated scene from the book students identify different characters’ points of view and give reasons why the author has used these (Chapters 3 and 8 provide text where the point of view changes between multiple characters). Students use the story and create their own new scene in the story, or they rewrite a chosen scene using a different cultural setting of point of view, or students imagine that they are in Mareka’s position, living in a small village in Greece. Students could also rewrite the dialogue from a scene from the book replacing it with contemporary colloquial language. Negotiate with students a rubric for scaffolding their writing and assessing their responses. Understand how content can be organised using different text structures depending on the purpose of the text. Understand how language features are used to link and sequence ideas. Include writing and images to express and develop in some detail experiences, events, information, ideas and characters. Demonstrate understanding of grammar and choose vocabulary and punctuation appropriate to the purpose and context of their writing. Use language features to create coherence and add detail to their texts. McDonald, L. A literature companion for teachers. PETAA, 2013. Derewianka, B. A new grammar companion for teachers. PETAA, 2011. Unit Suitable For AC: Years 3 and 4 (NSW Stage 2). Five Times Dizzy is a suitable novel to explore with middle primary children and provides rich opportunities to develop understandings of the concepts of family and multicultural communities. This text allows teachers to explore sensitively the issues of tolerance and prejudice. Duration The novel is a moderate length (85 pages) and could be enjoyed with the class over a week, breaking it down into four or five shared or modelled reading sessions. The activities presented provide for a more in-depth study of the text over a term. Activities are flexible and are suggested starting points for teachers to expand upon using their own expertise. Students' own inquiry questions will determine the depth and tangent the study could take. AMANDA WORLLEY is a qualified teacher-librarian and classroom teacher who is a strong advocate for using quality children’s literature for teaching and learning and has a special interest in multiliteracies and using ICTs. She has also been a sessional tutor/lecturer at Griffith University and has taught in Multiliteracies, ICT for Teaching and Learning, Numeracy and Literacy in the Curriculum, Mathematics Education and The Collegial Classroom.